Proposal: New internet protocol I’d call “socnet”. Similar to RSS, it’s a subscription protocol delivering data via XML file format. Users can create and host ‘social data’ in any tool and on any server, or using a site like Facebook. Other individuals request to connect to the socnet feed of a user, who then accepts them, but can limit–at the individual level–which feed elements (files and folders) the individual can read. Any tool requiring socnet data is granted it by the reading individual. So your contacts app would point at your socnet aggregator app; your calendar app, too; and so forth. Status updates and media sharing are just like normal RSS, basically: a content category, but based on one entity (user, business, group) instead of a site or search. Result: A platform-independent social networking protocol that abstracts user data out of sandboxed services. Major Bonus: Contact data is only maintained in one data store: the user’s! 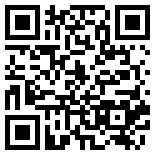 No more obsolete contact details, for those to whom you subscribe. Personal calendars could be similarly driven. Anything you’d need to share and sync that currently requires manual data entry or linking. I decided to try out Google App Inventor, being invited to the Beta. I wanted a simple enough project to get a feel for the process without becoming bogged down in complex logic or user interface (UI) design. It occurred to me that a random Oracle generator for the In A Wicked Age role-playing game by Vincent Baker would be interesting enough and maybe even useful to others. App Inventor uses OpenBlocks as a visual programming environment. Very cool for beginners, but also very mouse-intensive when one has repetitious tasks (like pasting in 208 lines of text! )—I’d have liked to be able to edit a TXT or XML file to populate the Oracles lists. Copy the set-specific list to the OraclesCurrent temporary list. Populate the first Oracle label element’s Text with a random Oracle from the list. Set the second label’s text to the same value as the first. While the second is the same as the first, populate the second with a random Oracle from the list. Repeat Steps 2 and 3 for the remaining two label elements, checking them against all preceding labels. Put another way, an Oracle label element can not contain the same Oracle text that is currently in any preceding label element. The rest of the app is a simple UI of buttons for choosing an Oracle set (the BloodAndSex.Click event in the logic shown) and, of course, four global list variables (one-dimensional arrays) to hold the Oracle-set-specific text (the OraclesBloodAndSex in the logic shown). In A Wicked Age is ©2007, Vincent Baker, all rights reserved. 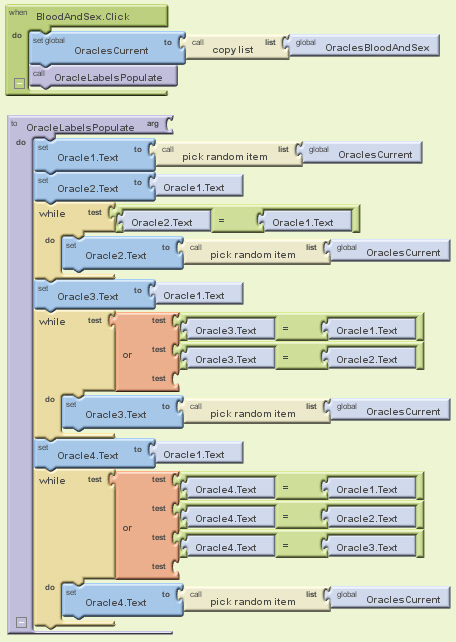 IAWA Oracles For Android app is ©2011, David Carle Artman, CC-BY NC 3.0. A donor registers what they have to donate on a Google map, and chooses a range of pickup time (e.g. a restaurant will usually want it to be between 2pm and 4pm; a grocery store might prefer 10pm to 2am). Options to schedule recurring pickup days, dates, and times. A recipient registers current stock (one-time, upon setup), storage maximums by volume or weight or other? (one-time, upon setup; and if storage increased), pickup minimums by volume or weight (below which it’s not worth the bank’s costs to pick-up; adjustable as needs change), and projected need (daily, weekly; based on history, once sufficient data is accumulated). A bank’s delivery drivers are given a “traveling salesman” shortest route to pickup donations equivalent to the bank’s projected need. When they commit to the route, those donations are not made available to other banks unless released later by the receiving bank (to be re-distributed where most needed). Initial setup form, as donor only or recipient/donor. Site (donor or bank) location definition, via manual text entry, push-pin on Google map, or GPS. Secure verification of valid bank via server check against state or municipal registries. User deletion of “bad” donor locations -OR- “bad” donor location reporting and server-side banning. Multiple location support, for owners of several donor businesses or managers of multiple food banks. Route navigation interface, once a bank’s delivery drivers commit to best-route pick-ups. Option to use less efficient routing, if necessary to deliver more balanced meals at a given bank or system-wide. Historical data storage, server-side or locally, for need projection for a given distribution period (day, week, month?). Optional automatic application of need projections based on historical data, with ability to adjust before submitting to server for distribution. Application development and maintenance – Open source community? Grants? Validation of food banks against municipal or state charters – Possibly manual labor; possibly automatic with connection to government systems. Server-side data accumulation and re-distribution to apps – Possibly a function of a public Google map; more likely hosted via grant or by government servers. This work is distributed by David Carle Artman under the Creative Commons Attribution-Noncommercial-Share Alike 3.0 License.